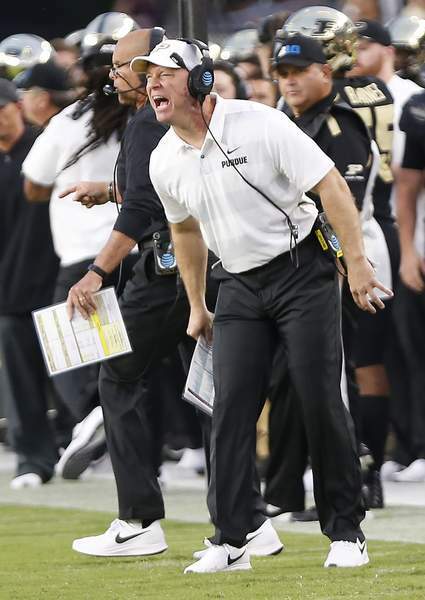 Associated Press Purdue coach Jeff Brohm was unhappy with his team's defense in a loss last week to Northwestern. Purdue coach Jeff Brohm thought his defense looked every bit as bad on tape as it did in person last week. It gave up 31 points, more than 400 total yards, forced no turnovers and struggled to get off the field. When the Boilermakers did get a crucial third-down stop with 2:31 to go, Lorenzo Neal was called for a personal foul and Northwestern ran out the clock to seal its win. Brohm didn't like the results or the effort. So this week he issued a challenge. For the moment, it doesn't sound like lineup changes are imminent. But if the approach doesn't change – and fast – Brohm may not have a choice. Today, the Boilermakers (0-1) welcome Eastern Michigan to Ross-Ade Stadium. Many outsiders expect this to be a tuneup for next week's contest with Missouri, but Brohm knows after seeing the Eagles (1-0) pile up 51 points and 473 total yards while going 7 for 7 on third-down conversions against FCS foe Monmouth last week that's not the case. This week, Eagles quarterback Tyler Wiegers faces a bigger, stronger, deeper, more daunting opponent in his second career start. But if the Boilermakers' defense turns in another dud, Brohm knows what the ramifications could be. Last year, the Eagles soared past Rutgers on the road for their first win in 59 games against Power Five teams. This week, they're seeking a second straight victory over a Big Ten foe. Brohm's message is short and simple. Purdue pulled starting quarterback Elijah Sindelar just before halftime last week after his third interception. David Blough stepped in and rallied the Boilermakers in the second half but fell short of a victory. Who starts this week? Brohm is keeping his choice under wraps.